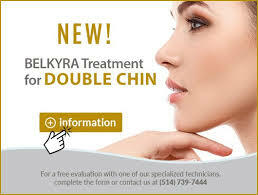 Essentially the treatment involves dissolving fat around the jawline, neck and under the chin using injections. It’s for people who have a double chin or pouch of fat around the jaw but it can be used anywhere on the body . When injected below the chin, the injection breaks down the fat cells which the body then absorbs and excretes. After treatment expect the area to swell up quite a bit for a few days before going back to normal . Results will vary from patient to patient . The treatment itself takes 20 to 40 minutes. At least two treatments are necessary and some clients can see great results after only two treatments. The procedure isn’t cheap & each treatment will cost approx. $1000 . The good news is that once the fat is dissolved you’re pretty much done though a maintenance injection may be needed after four to five years.